Leo's Passagen: Will the Jewish silver craft survive in Yemen? Will the Jewish silver craft survive in Yemen? Numbers of the once prominent Jewish community in Yemen are dwindling fast. Especially since the revolution, many Jews fled from hostility in the northern province of Sa’ada and Amran. The exact number of Jews left in the country is unknown, but government sources estimate it around 450 people, while Jewish organizations in the United States estimate it at slightly over 100 people. Of the ancient cultural legacy of Yemeni Jewry, one element has stood the test of time, migration and revolution: The craft of hand-made silver jewelry. Last year in December, Yemeni silversmith Kamal Rubaih and retired American diplomat Marjorie Ransom presented a selection of Yemeni jewelry at the Library of the Congress in Washington, focusing on Jewish designs. Ransom and Rubaih have collaborated on the book “The Demise of an Ancient Craft”, to be published this year by the American University in Cairo Press. The book will deal with jewelry from all of Yemen, with particular attention to the near-forgotten topic of the Jewish silversmith. In his shop “World Friend” located in the old silver market in Sana’a, Rubaih collects jewelry in both traditional Jewish and Muslim designs. According to Rubaih, from the great variety of traditional jewelry made in Yemen, the most exquisite was done by the Jewish silversmiths in the northern mountains and in the large cities, alongside Muslim jewelry from Tihama, the Hadramaut and Mahra, where Indian influence is strong. Jewish history in Yemen, as reported by Arab historians from medieval times, goes back to the year 1451 BC, and legends still circulate that they settled in the Arabian Peninsula around the times of King Solomon. What was once a prosperous community, heirs to unique cultural traditions, is today an impoverished and rather marginal group in Yemen’s multilayered cultural landscape. The traditional silver jewelry of the Middle East – including Turkey and Iran – has been largely replaced by gold jewelry, much of it imported and not handcrafted. The larger repertory of styles and techniques in Middle Eastern silver jewelry – casting, chasing, embossing, repousse, filigree and granulation among others – have been left mostly to the work of a few specialized artisans. It is said that until the 1960’s, it was a deep-seated tradition for Muslims to give a bridal dowry in Jewish jewelry. At the once thriving silver market in Sana’a just 30 years ago both Jewish and Muslim silversmiths worked alongside each other. However, the ancient Jewish craft has declined progressively in the last decade as more and more Jews left the country or abandoned the craft. On the Muslim side, only a few silversmiths remain, but a few are attempting to rejuvenate the traditional Jewish style. 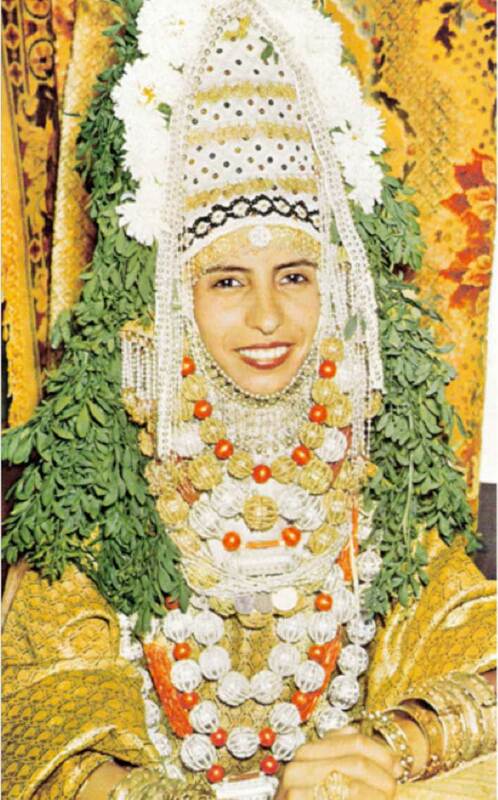 According to Rubaih, Yemeni brides these days prefer to wear gold over silver. Thus, only a few silversmiths continue to work in a trade that caters predominantly to tourists, many of whom have been chased away by constant unrest and Yemen’s deteriorating economic situation. Yet, it turns out that there are younger artisans, offspring of the elderly Jewish silversmiths, who are trained in the craft. They would like to take it up, if it were only possible to make a living with it. Unless there is an effort on the part of the Yemeni government to support traditional craftsmen familiar with Jewish silversmithing, as well as other artisans working with traditional crafts—weaving, embroidery, pottery and the like—Rubaih insists that it is very likely that they will soon disappear and with them, an ancient heritage spanning sometimes into thousands of years.